In my day, (I sound like I am old stating it that way) you waited until you had all of your permanent teeth and then went through the pain and astigmatism of having braces for years. I was told that this isn’t the way it is done today. They like to take a preventative approach now and start early. I can understand this. It makes sense that you would want to try to do the least invasive procedures and start with correcting the foundation before correcting the appearance. 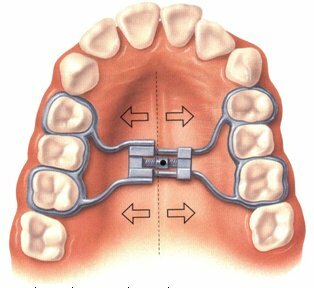 We are hopeful that by putting in an expander now Jackson’s jaw will be widened allowing for his teeth to go in the correct positions and eliminating the need for braces later on. That would be nice for him and for the pocket book! At any rate, we have gone into the office four times. The first time Jackson had a brief exam and we saw a slide show explaining what the plan would be. We were then ushered into a room with the lady who handles the bills. The cost and payment plan was discussed and we signed up! The next three visits consisted of pictures, x-rays, molds, spacers, and finally the actual device. I think Jackson is happy you can’t see it, but I know it is going to be annoying when he has to eat and clean it! We were given a water pick to clean it. I can predict who is going to want to have their hands on that right away and the mess that will follow! Now for the next three weeks I have to put a teeny tiny little pin in the device in the roof of Jackson’s mouth and turn it twice a day! This is going to take discipline! I will have to remember to turn it and will have to capture a busy 9 year old to do it! Oh joy!! Because we don’t have enough going on in our home right now! At least we only have to do it for three weeks! If all looks good we will just keep the expander in for another 3 months to keep the teeth in the right position. From there who knows….. It almost seems as if we have signed over his mouth for the next 5-6 years to do with what they want! Good bye sandy beach vacation – Hello sore mouthed pre-teen! An even trade if I ever heard of one!